Quick summary: In this lesson students design a dream car and create an artwork to represent their ideas that will be submitted to the Toyota Dream Car Art Contest. This contest encourages and inspires creative expression and imagination in students – some amazing ideas are born from dreams! 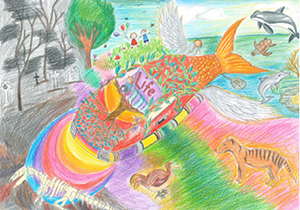 Students will examine the winners of last year’s Toyota Dream Car Art Contest, and evaluate the messages and visual conventions displayed in these artworks. Students then work as a class to brainstorm some ideas for their own dream cars, and then work independently to create their own dream cars artworks. Students understand what a dream (aspiration) is and why we should dream. Students explore things that a dream car could do. Student imagine a range of dream cars that can help people and our environment. Students work as artists to convey messages and meaning in their artworks. Syllabus outcomes: VAS2.1, VAS2.2, VAS3.1, VAS3.2, VAS3.3, VAS3.4, ST2-11LW, ST2-14BE, ST2-15I, ST2-16P, ST3-14BE, ST3-15I, ST3-16P. Cross-curriculum priority: Sustainability OI.8, Ethical Understanding. Relevant parts of Year 3-4 Visual Arts achievement standards: Students discuss how they and others use visual conventions in artworks. They use visual conventions, techniques and processes to communicate their ideas. Relevant parts of Year 5-6 Visual Arts achievement standards: Students explain how ideas are represented in artworks they make and view. They use visual conventions and visual arts practices to express a personal view in their artworks. They demonstrate different techniques and processes in planning and making artworks. Relevant parts of Year 3-4 Design and Technologies achievement standards: Students explain how products, services and environments are designed to best meet needs of communities and their environments. Relevant parts of Year 5-6 Design and Technologies achievement standards: Students describe competing considerations in the design of products, services and environments, taking into account sustainability. Level of teacher scaffolding: High – oversee discussion and brainstorm. Assist students with creating artworks. Submit entry forms. Resources required: Student Worksheet – one copy per student OR computers/tablets to access the online worksheet. Device capable of presenting a website to the class. Paper measuring no larger than 400mm x 550 mm (15.7-21.7in.) or A3 in size. Drawing materials, including but not limited to coloured pencils, pens/markers, crayons, paints, watercolour paints, etc. Sticky notes. 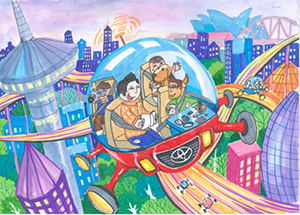 Toyota Dream Car Art Contest Entry Form, Toyota Dream Car Art Contest Conditions of Entry, Teacher Information Guide. Keywords: Dream, car, future, technology, sustainability, art. Learning intentions: Students understand the value of dreaming when thinking about and planning for the future. They recognise key elements of their own dream car and understand that a car can be more than a mode of transport. Students will recognise some of the ways artists convey message and meaning in their artworks. ... analyse in intent of artworks created by students their own age. ... use simple elements of social and environmental sustainability in a design project. ...utilise artistic creativity in their design project. 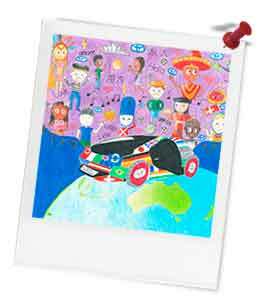 Teacher content information: The Toyota Dream Car Art Contest is a global contest held to inspire creative expression and imagination in children - some amazing ideas are born from dreams! 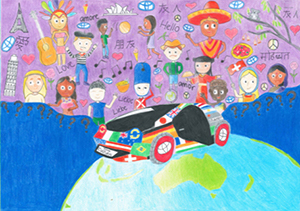 Students wishing to enter the competition are required to draw or paint a picture of what they imagine their dream car will look like. There are three age categories: under 8s, 8 to 11, and 12 to 15. Thought starter: What do you dream about? 1. What do you think this quote means? 3. What does this quote make you think about? 4. What does this make you wonder? What do you think this dream car does? What does this picture make you think about?